One of the biggest changes from the 1D Mark IV is the physical size of the 1D X’s sensor. The EOS-1D series has so far used an APS-H-sized (27.9×18.6mm) device that gives a 1.3x focal magnification. The 1D X uses a full-frame (36x24mm) CMOS sensor for a 1x magnification, as previously used by the EOS-1Ds and EOS 5D models. This sensor is a new unit with 18.1 million effective pixels and is the first from Canon to use gapless microlenses on a full-frame sensor. This means pixel size is increased, with each now measuring 6.9um compared with 5.7um on the 1D Mark IV and 6.4Ǐm on the 1Ds Mark III. Gapless technology was previously seen on the EOS 7D’s APS-C sensor and now features on the EOS 5D Mark III. The sensor features 16-channel output with two vertical-pixel simultaneous readouts and four separate four-channel analogue-digital converters to pass the signal to the processors. This, according to Canon, is 1.4x faster than the 1D Mark IV, which means the frame rate has increased to 12/14fps on the 1D X. The higher rate is only available with the mirror locked, so the camera cannot continue to focus while shooting. The frame rate is also limited to 10fps at ISO 3200 or above. Working alongside the new sensor are the dual Digic 5+ processors. These have three times the processing power of the Digic 5 processors, which in turn offered dramatic improvement over the Digic 4 units used in previous EOS-1D models. These play a large part in the camera’s high-speed shooting ability, but are also responsible for its ability to shoot at greater ISO sensitivities. With a standard range increased by 2 stops to give ISO 100-51,200, and an extended range providing a low ISO 50 and high settings up to ISO 204,800, the 1D X matches the Nikon D4 at its highest value. The files output in a choice of 14-bit raw (CR2) and JPEG at 5184×3456 pixels, with options for Mraw (3888×2592 pixels), Sraw (2592×1728 pixels), M1 JPEG (4608×3072 pixels), M2 JPEG (3456×2304 pixels) and S JPEG (2592×1728 pixels) sizes. Users can choose to combine any of the raw with any of the JPEG settings for dual shooting, and also control the compression individually for each of the JPEG settings. Raw files are already supported by Adobe Camera Raw and the camera comes with Digital Photo Professional software for processing. It does seem slightly unusual that the 5D Mark III shoots at a higher resolution than the 1D X, despite the difference in print size being only 3-5mm at 300ppi. Perhaps a 36-million-pixel version of the 1D could still emerge. An additional Digic 4 processor features purely for the exposure system on the 1D X. The metering uses a 100,000-pixel RGB AE sensor and 252 metering zones. Previously, Canon metering systems have been monotone in their design, but the ability to ‘see’ in colour can help detect what is in the scene. This uses the ISA (intelligent subject analysis) system and allows face detection through the viewfinder, not just when in live view mode. ISA also works with the auto light optimiser correction system to set the best exposure. Evaluative metering uses a matrix of 252 zones to analyse the scene, while more prescriptive partial, centreweighted and spot options are also available. Spot metering by default reads from the centre of the viewfinder, but can be linked to the active AF point or chosen individually in up to eight positions for multi-spot readings. Should it need to be corrected manually, there is ±5EV exposure compensation and auto bracketing of up to seven shots. 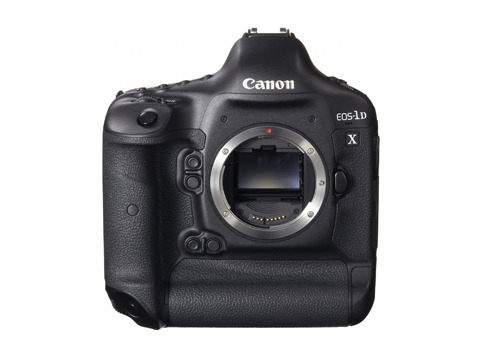 The 1D X is compatible with the full range of Canon EF lenses and third-party models using the EF mount. The exceptions are EF-S-mount optics, which provide coverage for APS-C-sized sensors only. There are also focusing implications for optics with a maximum aperture of smaller than f/5.6, as we explain in the Autofocus section. Two CompactFlash card slots feature, allowing one to be used as an overflow, or to record different formats to each card, or to duplicate content to both cards for backup. There is no move towards SD or the new XQD card here as in the Nikon D4. When using a SanDisk Extreme Pro (UDMA 6) card, 20 raw or 20 raw+JPEG files can be shot before filling the buffer. Using just large JPEG files, the camera showed no sign of letting up after over 800 shots. The battery has been upgraded from previous models, increasing the power from 2,300mAh to 2,450mAh, although it remains compatible with the old LP-E4 units, and the new LP-E4N battery can be used in the 1D Mark IV body. The LP-E4N gives 1,120 shots in regular daytime temperatures, which is less than the 1,500 shots of the 1D Mark IV, presumably due to increased power consumption in the 1D X. The 1D X leaves users wanting for almost nothing. The only question is whether Wi-Fi functionality could have been built into the camera rather than offered separately.